Selkies are creatures who in one form look completely human and in their other form are that of a Seal. They are also known as the Seal Folk and Seal People. Unlike some other creatures of the sea, the Selkie are often friendly to humans and other surface races. Stories of the Selkie rescuing humans from certain death at sea are relatively common. The Selkie transform using the skin of a Seal. When they take off the skin, they transform into the form of a human and when they put the skin back on, they transform back into that of a seal. Stories tell of them dancing the shores in the moonlight. There is a wide variety of legends surrounding their skins being stolen by humans and keeping them captive. Often, the Seal Folk will find their skins years later to return to the ocean. Other stories are of a normal human and Selkie having a relationship. Some are romances which can last for many years while others are just short dalliances. Romances often end with the Selkie longing for the Sea and returning, often breaking their lover's heart and leaving children. As well, there are many stories about male Selkie about being extremely amorous and often coming to the surface to find mortal 'unsatisfied' women, both those without husbands and those who are married. Unlike most supernatural creatures, Selkie and humans can produce children. These children are considered to be Selkie. Often the children will not know about their background for many years although they always feel something different. One they pass through puberty, they usually transform for the first time. The transformation can be extremely shocking to them the first time they transform. In seal form, Selkie normally have white fur. Because of this, most seal hunters who know the legends of the Selkie will not hunt white seals. 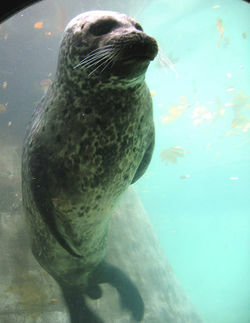 Otherwise, their features when they are in their seals form are that of the common or harbor seal. The weight of the Selkie does not change when they transform between forms. In human form, they tend to be quite attractive with light blond hair and blue or green eyes being most common. Some have almost white hair. Their features tend to be nordic and they tend to be extremely lithe. M.D.C. (Rifts): Become M.D.C. Structures with an M.D.C. of P.E. x 2 + 1D4x10 + 2D6 per level of experience (plus those gained from O.C.C. 's and physical skills.) The Seal Skin has 1D4x10 M.D.C. when separated from the Selkie. Hit Points / S.D.C. (Non-M.D.C. Worlds): Hit Points: P.E. x 2 + 2D6 per level of experience. S.D.C. : 1D6x10 plus those gained from O.C.C. 's and physical skills. The Seal Skin has 1D6x10 S.D.C. when separated from the Selkie. Transform between human and seal forms three times per day. Requires their seal skin to transform with transformation requires thirty seconds (two melee) to change between forms. If the Selkie loses the skin, the skin is destroyed, or it is taken, they are trapped in human form. Keep same mass when transforming between human and seal forms. Bio-Regenerates 2D6 points per hour. Combat: Two without combat training, or those gained from hand to hand combat and / or boxing. Bonuses: Only those gained from attributes, O.C.C., and skill bonuses. Psionics: Standard, basically same as humans. Habitat: Mostly found in areas along the coast, sometimes in small cities while other times in rural areas. Live in small communities of Selkie with about half of their time in the water. They have secret island communities in some places and hidden caves. There is likely only a couple of thousand total on Rifts Earth. More common on the Palladium World. Copyright © 2007 & 2009, Kitsune. All rights reserved.